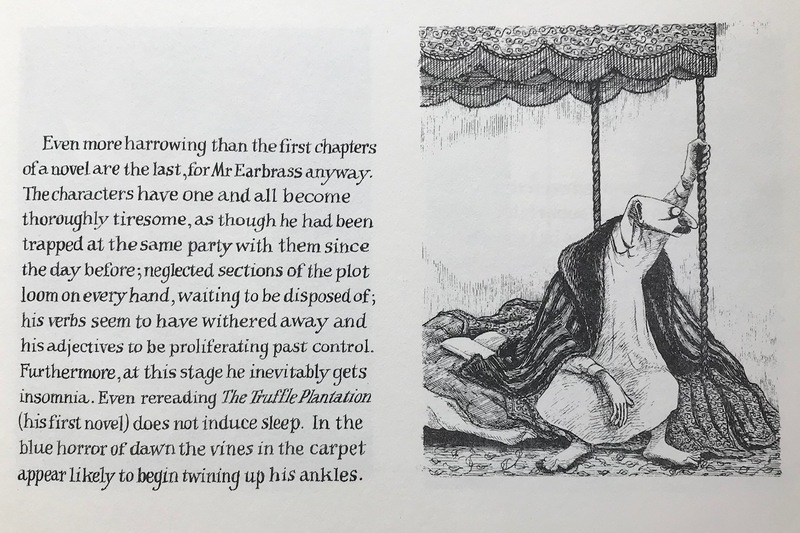 Did Edward Gorey predict NaNoWriMo? Probably not, but every November I have to reread The Unstrung Harp, to remind myself that every stage of the creative process is well known and documented within this tiny (just 30 pages) book. I’m now at the stage illustrated above (p. 14). I hate all my characters and would love to put them on a one-way boat to nowhere, and then just curl up with a good book and a box of chocolate. Maybe just one big explosion will take care of them all for me. But I also know this will pass. Already, my mind is toying with new ways to put my MC into mortal danger before she finally escapes. Thanks for letting me vent. Happy Thanksgiving to my US readers, and a happy rest of the week to all. Keep reading, keep writing. This entry was posted in Am procrastinating, Am writing, NaNoWriMo. Bookmark the permalink. 4 Responses to Who’s big idea was this anyway? 🙂 I’ll add that to my ever-lengthening list of projects!